La Limena on Rockville Pike is the place where we meet friends to talk about our upcoming trip to Peru. It’s where we go when we want to revel in the flavors we enjoyed on that trip. We head to La Limena after an hours-long car ride, and again on a night when doing anything more than looking at a menu and pointing seems likes too much work. Until recently, a visit to the popular restaurant meant putting up with waits for tables squeezed in a little too close for comfort. But it seemed a small price to pay for consistently good food, and we did it willingly. La Limena has now sprouted an offshoot just down the road from the original location. The fresh, spacious La Limena Grill bears a resemblance to the original, but its merits are multiplied. You shouldn’t have problems getting a table at La Limena Grill, at least for now. Dual dining rooms are separated by an entrance way. On our visit only one side of the restaurant is utilized, but the room is full. There is plenty of space between the tables, which results in a less frenetic experience. 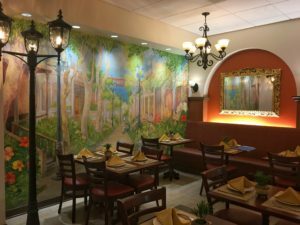 The décor at La Limena Grill is appealing, with an old-world Peruvian motif. Wall murals decorate both rooms, accent walls are painted a deep coral, and swirled iron light fixtures and partitions add pizzazz. This is a place where you want to linger, and you can. Much of the menu at La Limena Grill duplicates the original, although you’ll have to head back down the street for Cuban dishes and rotisserie chicken. Ceviche de Pescado is our go-to appetizer, eliciting memories of the typical cuisine we enjoyed in Peru. Fresh fish marinated in lime juice and chiles, served with chunks of sweet potato and choclo (Peruvian corn), is satisfying as always. I would prefer it, however, if the blanket of red onions was a little lighter. 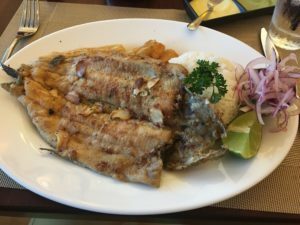 Trucha Frita al ajo, lightly fried boneless trout with crispy roasted garlic, yucca, rice, and salsa criolla frequently appears on our table during visits to La Limena. My husband proclaims that the new location has improved on his favorite dish. I am resolute in trying something unique to La Limena Grill. 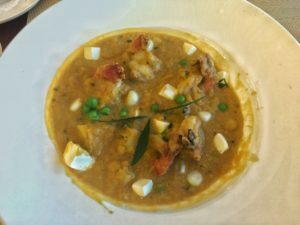 “Locro arequipeno con camarones” is a mild stew which incorporates shrimp, squash, peas, diced cubes of cheese, potatoes, and corn. The Peruvian potpourri is substantial and quite pleasant, but I would only order it again to share. A little of this concoction goes a long way, and ultimately I really just want to spoon out the perfectly prepared shrimp. Authenticity reigns supreme when it comes to dessert at La Limena Grill. Native Peruvian fruits such as lucuma and chiromoya flatter ice cream and mousse. There’s also flan, rice pudding, and handsome alfajores cookies filled with caramel. The popularity of La Limena- named one of the Top 100 restaurants of 2017 by Washingtonian– is undeniable. 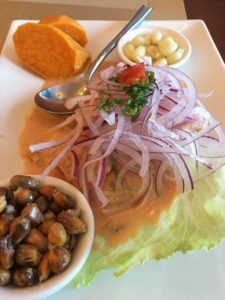 The new La Limena Grill is reminiscent of the original, but it manages to be even more evocative when it comes to replicating the flavors and the feel of Peru.